Attorney General William Barr is returning to Capitol Hill for a second time this week as lawmakers, the White House and the American public anxiously await his release of special counsel Robert Mueller’s Russia report . Justice Department officials are scouring the report to remove grand jury information and details relating to pending investigations, among other materials. Democrats have escalated criticism over Barr’s handling of the document and say they will not accept any redactions. The House Judiciary Committee has approved, but not sent, subpoenas for the report , and top Democrats have said they are willing to take the battle to court. At the House hearing, Barr bluntly defended himself, arguing that portions of the document need to be redacted to comply with the law. He said he’s open to eventually releasing some of the redacted material after consulting with congressional leaders, but he drew a line at releasing grand jury material, which would require court approval. He said Democrats are “free to go to court” themselves and ask for the grand jury information. Barr wouldn’t discuss the substance of Mueller’s findings but did explain some of his process for receiving and reviewing the report and what to expect when it is released: He said the redactions will be color-coded and accompanied by notes explaining the decision to withhold information. “This process is going along very well and my original timetable of being able to release this by mid-April stands,” Barr said. 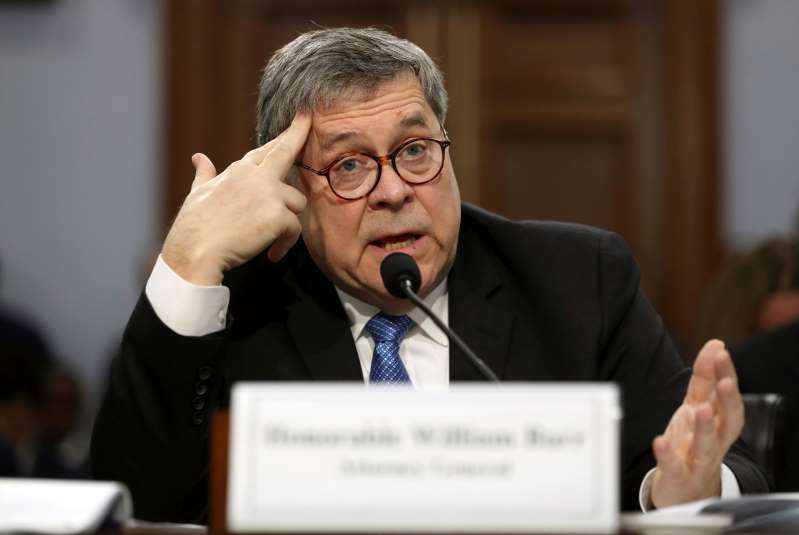 Democrats said they were concerned that a four-page summary letter of the report’s main conclusions Barr released last month portrayed the investigation’s findings in an overly favorable way for President Donald Trump. The letter said that Mueller did not find a criminal conspiracy between Russia and Trump associates around the time of the 2016 election and that Barr did not believe the evidence in the report was sufficient to prove the president had obstructed justice. Barr said “the letter speaks for itself” and revealed that he gave Mueller an opportunity to review the letter, but he declined. Republicans defended Barr, with Alabama Rep. Robert Aderholt comparing Democrats’ questions to theories surrounding President John F. Kennedy’s 1963 assassination. “So many of the questions here today have gone toward a grassy knoll conspiracy theory,” Aderholt said. House Judiciary Committee Chairman Jerrold Nadler, D-N.Y., said he was unsatisfied with Barr’s answers to the appropriations panel, saying he could issue subpoenas “very quickly” if the report is released with redactions.